Regrading allows you to move teams in and out of competitions and into other competitions if necessary. Please note: when regarding, the season that will show is whatever is chosen in the 'default' season'. 1. 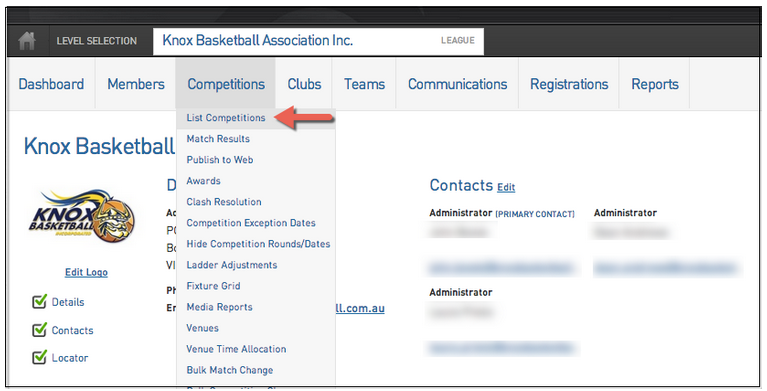 To regrade one on more teams hover over the Competitions tab and click List Competitions. PLEASE NOTE: If as a result of regrading the number of Teams in the Competition will change, you may need to also modify the "Max Number of Teams" and "Fixture Template" options from the Competition set-up screen before you commence regrading. 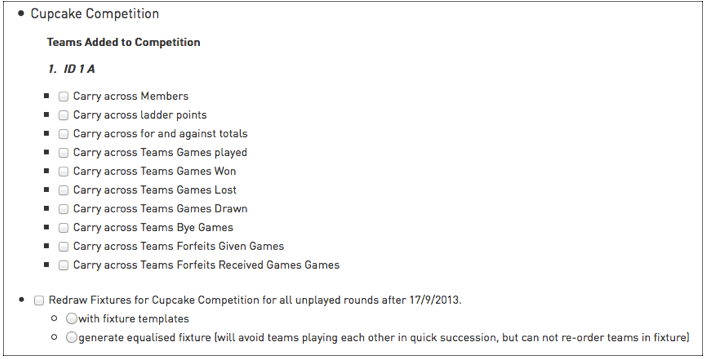 This is a very important step because re-drawing the fixture will not be possible until this is done. 2. 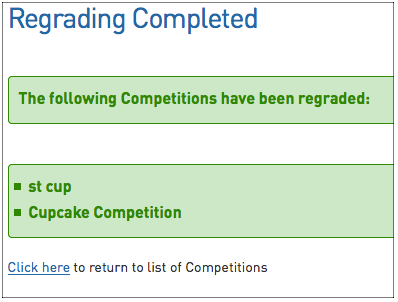 At the Competitions screen you will see the Regrade button in the top-right hand corner. Click on this to access the Regrading section. 3. 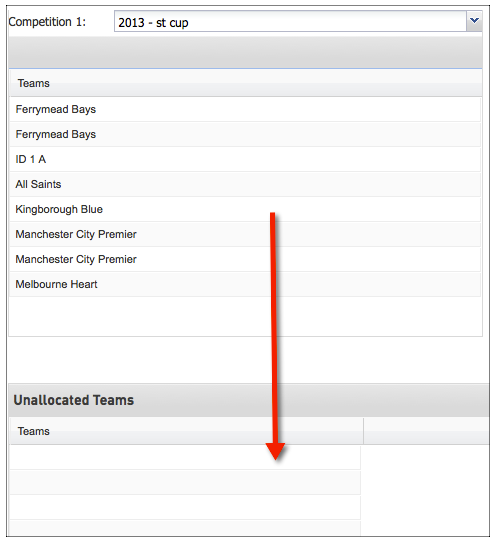 In this screen you will see two boxes that allow you to display the teams currently assigned to a particular competition as well as box at the bottom that displays all currently unallocated teams. To select the competition you need to regrade a team out of select the competition in one of the two drop-down boxes. If you only wish to remove a team(s) from a competition you will only need to select one competition in a drop-down box. If you wish to move one or more teams from one competition to another you will need to select the other competition in the other drop-down box. 4. To move a team from one competition to another simply drag-and-drop this team into the other competition. . The moved team will then appear in the list of teams for the other competition. 5. If you only wish to move a team out of a competition and not into another simply drag-and-drop the team into the Unallocated Teams box. 6. You can go through and make as many regrading changes as you would like. Once all these have been made click on the Preview and Save Changes to move to the next screen in the process. 7. The next screen in the regrading process will ask you what rules you would like applied on the regradings that you have made. If you have only moved teams out of a competitions and into the Unallocated Teams box without moving any teams into other competitions you will not receive any prompts you will only be told the changes that are set to be made. You will be asked if you wish to redraw the competition that any teams has been removed from. If you select not to redraw a competition and the competition previously has an even amount of teams but will now has an odd number then the teams due to play the removed team will now have byes those rounds. If the competition previously had an odd number off teams and will now have an even number then byes will be removed and each team will now play opponents each round. If you do choose to redraw the fixtures for ticking the box this will be done using the standard template relative to the new number of teams in the competition. For each team that has been added to the competition you will be asked whether you wish to Carry across ladder points and Carry across for and against totals. By carrying across ladder points you are saying that you want the total competition points that the team accrued in the previous competition brought with them into the new competition. By carrying across the for and against totals you are saying that you want the total amount of goals for and goals against for the team brought across into the new competition. Note: Obviously both of these will affect the ladder so you need to be careful when selecting these. Again, you will be asked whether you wish to redraw the competition. If you select no and the competition will move from odd numbers to even numbers then the added team(s) will replace any byes in the competition. If adding the team(s) will change the competition from being even to an odd competition than byes will be created in each round. If you do choose to redraw the fixtures this will be done using the standard template relative to the new number of teams in the competition. 8. Once you have made all the selections on this screen either click on the Save Changes icon to process these regrading changes or Cancel Changes to abort the process. 9. If you select to Save Changes then you will be taken to a confirmation screen. 10. To return to the competition screen click on the Click Here link.